Wow! What a time to be a fan of the Green and White! The Michigan State University Men&apos;s basketball and Football teams have been experiencing so much success (and in dramatic fashion) that Spartan fans around the world, let alone right here at home in Greater Lansing have hardly had a chance to catch their breath. First you have an amazing Spartan football season which gives us another incredible 11-win season, a Legends Division Championship in the Big Ten Conference formats inaugural year and a thrilling triple-overtime victory in the Outback Bowl in Tampa Florida on January 2nd. Coach Dantonio has this program solid as a rock and headed in the right direction for years and years of more great Spartan wins. Then, not to be out-done, is the MSU Men&apos;s basketball team! After two losses to start the season (to perennial power-houses Duke and North Carolina) the Spartans have been on a 13-game win streak capped by taking their first two big ten games to up-and-coming Indiana and pesky Wisconsin. In fact, last nights win at Wisconsin was the first on their court in a decade - hard to believe considering all the success our program has experienced under Coach Tom Izzo. Just like with the football team the Spartans went to overtime last night in Madison and came out with a victory when it was shown a buzzer beating 3-pointer to tie was in fact not put up in time. 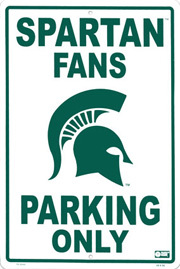 All these exciting wins for the Green and White make me proud to be a Spartan (as if I need much help with that) and so hungry for the rest of the Men&apos;s Basketball season and even for the long-awaited return of Spartan football in September. what did you think of the Spartan football season? Think we&apos;ll be smelling roses next year instead of Outback Steaks? How about the Spartan hoop team? Wasn&apos;t this supposed to be a rebuilding year for Coach Izzo? I don&apos;t know about you, but I&apos;m thinking Big Ten Champs if this hot streak keeps up. No matter how you look at it, it&apos;s great at State!